Digger Mobile Edition is a faithful port of the 1983 IBM PC game Digger. 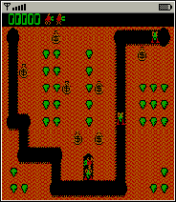 The object of the game is to collect emeralds and gold from an abandoned mine while avoiding the Nobbins and Hobbins. Push bags of gold down mine shafts to break them open and retrieve the gold. Gold bags also crush Nobbins. The app “DiggerME” (120 KB) is ready to download or send to your phone as filename: “diggerME”. is there any available? for our smartphone here?? you should have also free basics for smartphone . You can use Free Basics with smartphones. why is it that it doesnt works?? if the game doesn’t work it’s usually because your phone doesn’t support a Java ME feature that the game requires. To download to any device click the Download link above. For the download to succeed you need paid data (Free Basics blocks downloads) and a phone that supports Java ME. this JAVA ME will work also on KEN XIN DA phone? Sorry, I don’t know anything about KEN XIN DA phones. Check your phone’s specs. If the phone supports Java ME apps Digger ME will probably work. Use the Play store app on your phone to download Android apps. These apps are not for Android phones. Does it work on non-android phones? how much is the datd charges? Multiply the size of the game by your operator’s price per KB. The game is cheap! !Super duper cheap! !And its weird..
Free Basics blocks downloads so your operator charges you for the data used to download. How to donwload this app. Why i can’t play it ? I don’t have a clue based on the information you provided. Where i can find the free games? Open this page in your phone’s browser and click the download link. Downloading requires paid data. what games available on cherry mobile t18 and how to download games? How to download it? Because it cannot download to my phone ! ! What phone as you using and what does the error message say? cant download to my phone it only says download failed …why?? Not on BoostApps. Try a web search. It works on the LG 840G. Realky, but its not working in my cherrymobile? Please verrify with Cherry Mobile that your phone supports Java ME? I suspect it doesn’t. The apps on BoostApps are Java ME apps, if your phone doesn’t support Java ME nothing you or I can do will make them work.